Wow, I still can't believe we are almost at the end of 2014! Ofta, where did the year go? It sure flew by~but I am looking forward to a lot of good things to come in 2015! We are especially "excited" for our two new Grand babies coming this year! Yup, both my daughter and son in law which are due in Feb and my son and daughter in law in July! Wow, can it get better that that?! Today, I have a fun little card to share with you today using a cute cut file from the Silhouette Store. Isn't this little fella adorable? I used papers that were in my scrap bin, yeah! I can't believe how full my bin is again~how about you? After cutting the reindeer with my Cameo, I pieced it all together and adhered in place. 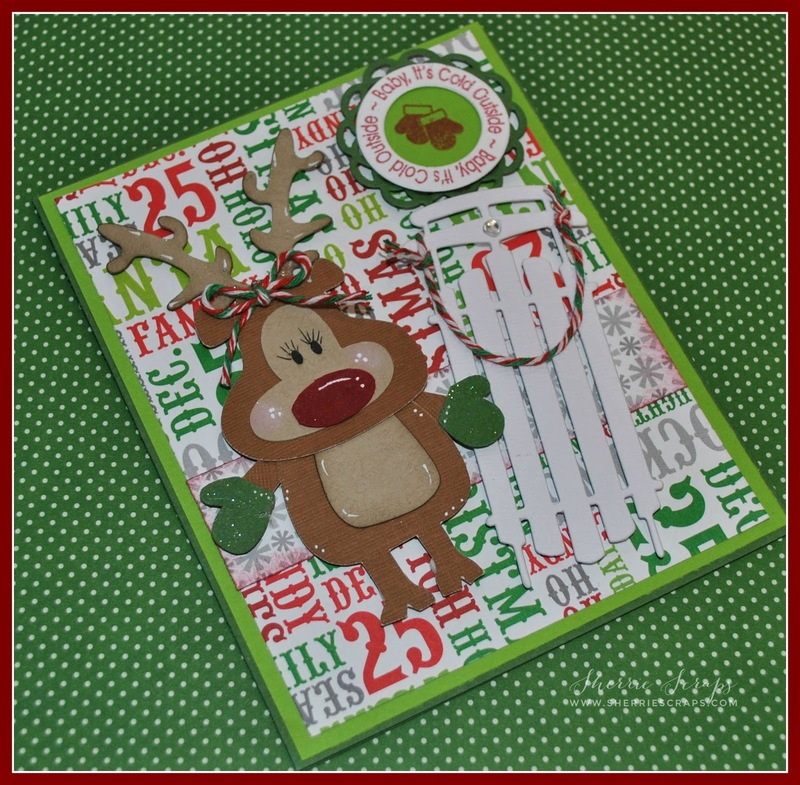 The fun little sled is from SU Watercolor Winter Simply Created card kit that a friend gave me. So cute, ha? The doily is created using My Craft Spot's Tiny Doilies metal die and stamped with the Stamping All Around Christmas stamp set. I finished with adding some fun twine to the project that is from Recollections. 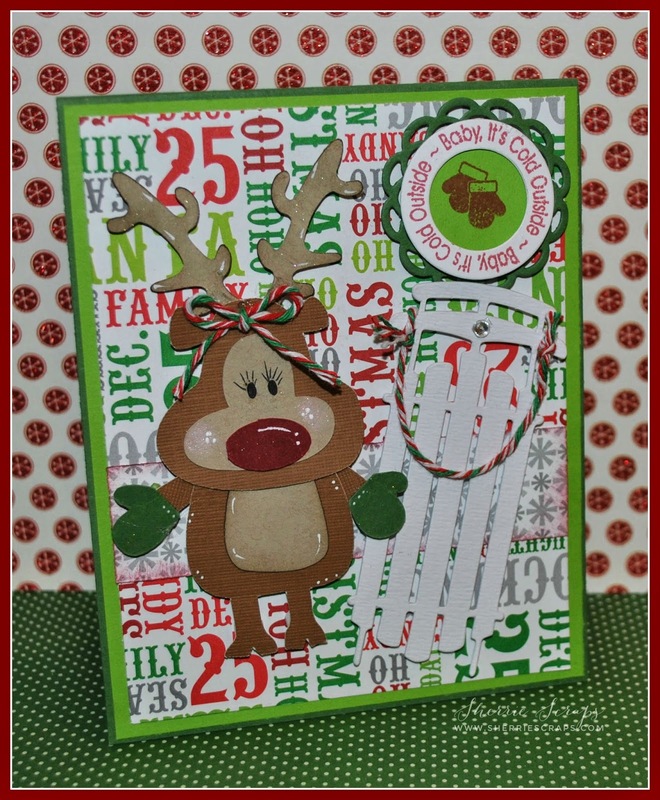 This adorable Sherrie, I jut love the reindeer nose and the sleigh is so fun, Happy New Year! My friend Hope it is a very healthy and prosperous. Aww super cute Sherrie!! Wishing you a very Happy New Year my friend! OMYGOSH!!! Sooooooooo cute! I love love love that reindeer!!! Happy New Year!!!! Oh goodness this is cute!!! I love this cutie! Such an adorable cut file and that sled... Love your added extra handle with the twine....brings me back to my childhood days when I would go sledding on that same type of sled! Happy New Year my friend! Such a darling card! Rudolph is so cute! Happy New Year! WOW!!! Congrats Sherrie!!!! That is such AWESOME news! I can not wait to see pictures of the new little ones! Your card is so super adorable!!!!! LOVE it my friend!!! Congrats on the new grandbabies..... That's the best news for the New Year..... Oh how exciting! Congrats! Super cool!! Absolutely ADORABLE!! OMG I just think your deer is so gosh darn CA-UTE!!!!! you really did one super Fab & FUN outstanding creative job!!! OMG Girl talk about being talented you get the award what a way to ring out the old and ring the new!! YOU so ROCK!! So sweet!! Happy New Year my friend. Too darn cute, Happy New Year! super sweet card sherrie, love the papers!! Wishing you and you family a very Happy New Year!! How exciting!! Two new grands on the way!!! Wonderful!!!! Love your card!! That reindeer is great and I love the sled with the twine. WOW how exciting 2 new babies. I know you on on cloud 9. I know I would be, Your card is too cute. The reindeer is adorable and I love the sleigh. Yay for an exciting year ahead!!! So so fun! You will spoil them rotten! Love your adorable card! That sweet reindeer is precious! Cute cute cute!!! I'm not sure how I missed this cutie! The card is just adorable! Congrats on the 2 new additions to your family this year, what an exciting 2015 for you! Wishing you and your family a Happy New Year!